AUGUSTA, Ga. -- Fourteen years after capturing his last green jacket, Tiger Woods is near the top of the leaderboard entering the clubhouse T2 ahead of Sunday's final round at the 2019 Masters. And it is not by happenstance as Woods as been grinding and thriving around Augusta National for three days as he contends with one of the most loaded leaderboards in major championship history. Though three of his peers went low with 8 under 64s on Saturday, Woods did just enough to remain in contention and ahead of most of the best golfers in the world. We say "most" because Francesco Molinari has once again lit up Augusta National in his own calm and consistent fashion, taking the solo lead ahead of Sunday's final round at 13 under. Still, with Woods' play and experience, another major championship crown appears to be more of a reality than flirting possibility this time around. Woods posted a 5-under 67 in Round 3, his lowest score since the final round in 2011 when he finished T4. After bogeying the fifth, Tiger was nearly perfect the rest of the way with six birdies over his final 13 holes. He did have opportunities to improve that score on the 17th and 18th but settled for par to enter the clubhouse at T2 at 11 under alongside Finau (one of those aforementioned 64s). Woods' play this week continues a stellar showing he has put forth at majors since his return from injury. After finding his bearings early in 2018, Woods finished T6 at The Open and 2nd at the PGA Championship despite posting a better final-round score (64) than eventual champion Brooks Koepka (66). Woods went on to win the 2018 Tour Championship in a memorable moment that resonated throughout the world of golf. 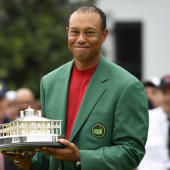 Though he does not have a major championship win since the 2008 U.S. Open, Woods has 11 top-10 finishes in the 28 such events he has placed since. A fifth green jacket would put him in solo 2nd all time, one behind the great Jack Nicklaus. Woods will be in the final pairing at Augusta National for the first time since 2007 when he joins Molinari and Finau at 9:20 a.m. ET on Sunday.